The Reserve Bank of Australia meets tonight and new central bank governor is at the helm. Phillip Lowe, former RBA deputy governor succeeded Glenn Stevens and investors will be paying close attention to the new governor’s tone. Chances are he is going to play it safe and maintain the central bank’s upbeat outlook. The last time they convened they expressed confidence in the trend of growth and labor market. When Lowe spoke last month, he said the labor market is not as strong as the unemployment rate suggests and inflation is expected to remain low for some time. 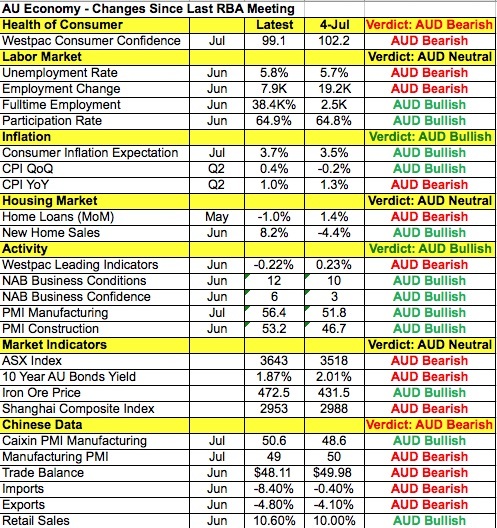 Taking a look at the table below, there has been as much improvement as deterioration in Australia’s economy since the last monetary policy meeting with broad improvements in China. So while RBA Governor Lowe may be optimistic, the main takeaway will be patience. AUD may fall on this but at a time when the central banks of the U.K., Eurozone, Japan and New Zealand are considering more stimulus, a neutral bias will make any declines shallow. In fact we believe the better trade is to be long AUD pre-RBA. 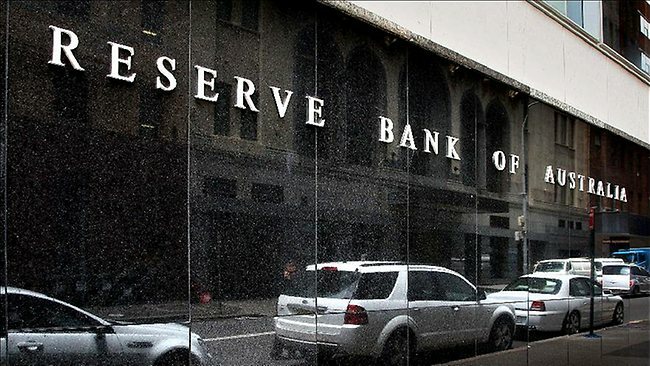 The Reserve Bank of Australia also has a monetary policy announcement and the majority of economists surveyed expect the RBA to cut interest rates by 25bp but we feel that a rate cut is not a done deal. 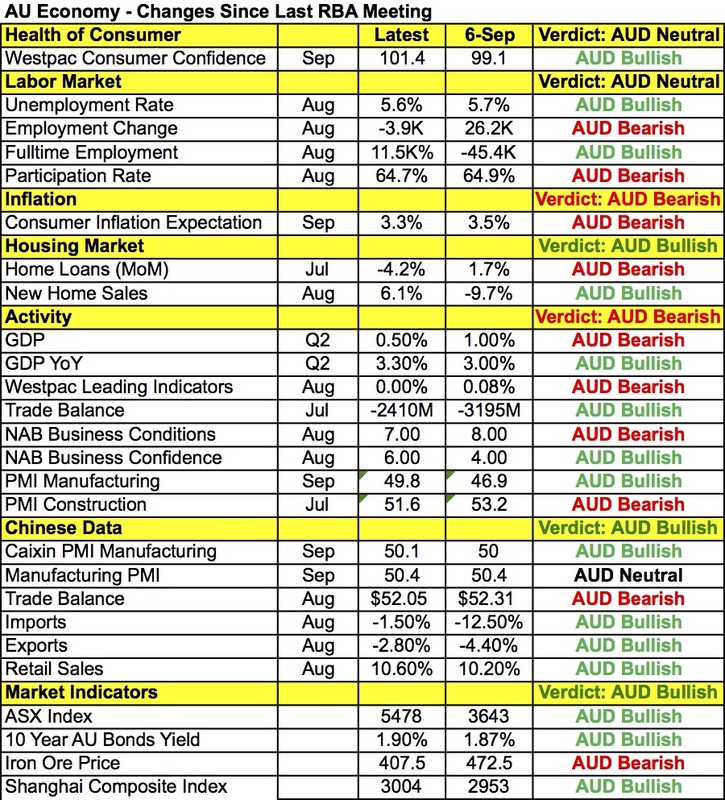 The last time we heard from the RBA they sounded open to the idea of easing if data supports it but since the last meeting in July, manufacturing activity accelerated, consumer prices increased, full time job growth rebounded, business confidence improved and the participation rate is up as shown in the table below. Granted consumer confidence is down and the unemployment rate ticked up, we’re not sure if this is enough for the RBA to pull the trigger on easing in August. The AiG Performance of Manufacturing Index rose to 56.4 vs. 51.8 previous. Chinese PMI numbers were mixed. The official manufacturing PMI showed a decline from 50 to 49.9. The Caixin Manufacturing PMI reading registered an increase in activity, coming in at 50.6 vs. 48.9 expected. Australia’s trade balance and building approvals report will be released pre-RBA but the rate decision will be key. If the RBA cuts, AUD/USD will drop below 0.75 cents quickly but if they hold rates steady, we should see Monday’s high of 0.7615 recaptured. 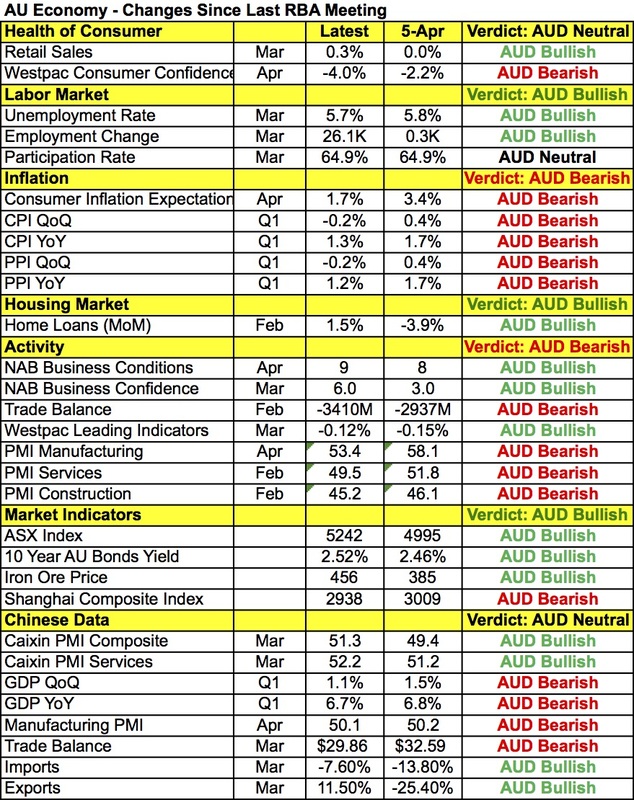 RBA May Preview – Will they Cut Rates? The main focus tonight will be on Australia and the Reserve Bank’s monetary policy announcement. At their last meeting the RBA left rates unchanged and said, “Under present circumstances, an appreciating exchange rate could complicate the adjustment under way in the economy.” Investors interpreted these comments to mean discomfort with the current level of the currency and sent AUD tumbling lower as a result. There’s a small subset of investors looking for the RBA to ease this month because CPI declined in the first quarter and activity slowed according to the PMIs. 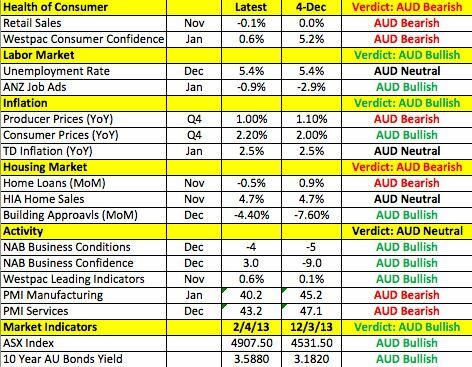 However according to the following table, consumer spending rebounded, business confidence improved, the unemployment rate declined and market indicators ticked upwards. So like many of their peers, the RBA may opt to wait and see how the economy performs in the next month before taking additional action.